It is difficult to define Heavy Artillery. Even the name can be a source of confusion. In the early and middle nineteenth century, army artillery was generally divided into three classes: foot, field, and light. Field and Light artillery were highly mobile and operated with armies in the field. Foot artillery, often called heavy artillery, was the branch of service associated with the operation of very large and difficult to move artillery pieces, such as those used to defend fortified places and lay sieges. Although the Regular Army did not subdivide artillery into classes, at the outbreak of the Civil War most volunteer organizations on both sides were specifically designated by the type of artillery duty they were intended to perform. Almost all volunteer organizations of Foot Artillery were called "Heavy Artillery." None included the more technically accurate description "Foot Artillery" in their name. The expected duties of "Heavy" Artillery were far less clear than those of their counterparts in the field artillery, and the uses to which Heavy Artillery organizations were put varied greatly. Some organizations served as de facto infantry, distinguished from true infantry only by their uniforms and designations. Other Heavy Artillery organizations were split up and used as field batteries, although they generally manned some of the largest weapons that could be considered field pieces. Most commonly, Heavy Artillery units were used in the defense of fortified places, serving as specialized garrison troops, or during sieges to serve mortars and other such difficult-to-move ordnance. 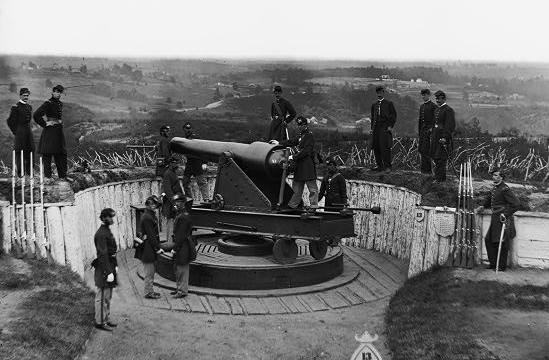 Early in the war, the Union established a ring of fortifications around Washington, D.C. to protect the city from Confederate attack. These forts were primarily occupied by Heavy Artillery units. While the Armies of the Potomac and of Northern Virginia maneuvered back and forth in Virginia, the troops of the Washington defenses generally stayed in place; their largest battles being with guerrilla groups bent on disrupting Union supply lines. 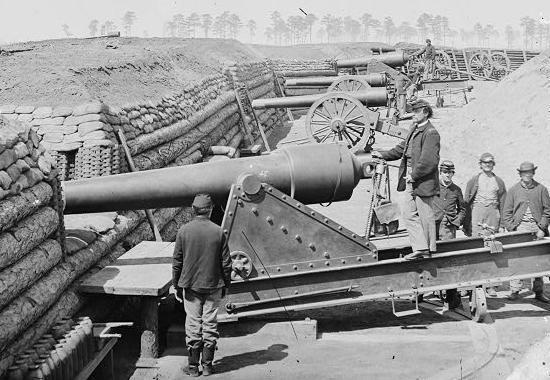 The Confederate authorities had no such manpower to spare for a similar defense of their Capital, but Confederate Heavy Artillery Units saw extensive action defending such points as Forts Henry and Donaldson, Island 10, Batteries along the James River, and the Harbor defenses of the many Confederate ports. In 1864, when Lt.Gen. U. S. Grant took command of all the Union armies, he decided to free up the manpower reserve around Washington, and began reassigning Heavy Artillery units for service as infantry. Some oversized regiments of Heavy Artillery were larger than entire divisions of infantry which had been dwindled by years of combat. Throughout the Overland Campaign (Battles of the 40 Days), at Cold Harbor, through the Seige of Petersburg, and right through to Appomattox, Heavy Artillery units serving as infantry played a significant roles in the ultimate Union victory in the East.